Online Brochure /// View Warranty InfoQuality is not expensive - it´s priceless, and if you´re running your own business quality is everything. If they´re not working, neither are you. If quality and up time are important to you, then make the smart choice - use a Digga attachment. Such is the build quality of the Digga product that we can afford to offer that extra bit of peace of mind. 3yr gearbox, 2yr motor & 12 month manufacturer warranty. 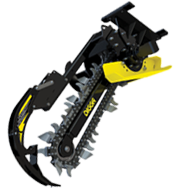 Digga trenchers are the ultimate in trenching precision, power and efficiency. Ensure maximum returns on your attachment investment with a great attachment for your Excavator, Backhoe, or Skid Steer Loader. Digga has 5 base models available for trenching depths 450-1200mm and widths 100-350mm. 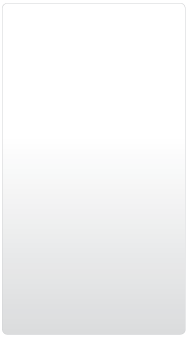 Standard flow and high flow options are also available on some models to optimise your machine's power and performance. The Adjustable Skid Foot in the Mini Bigfoot, Bigfoot, and Bigfoot XD range provides the operator with precision depth control and ensures the spoil auger has optimum ground clearance so you can take full advantage of every bit of valuable horsepower when trenching. Powered by a compact Digga planetary gearbox and Eaton hydraulic motor, you can be guaranteed of quality and superior performance. 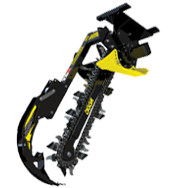 If you are up for some serious trenching, consider Digga's Hydrive and Hydrive XD trencher range. Unique Drive System Positioning allows for more usable horse power, providing greater efficiency for serious trenching. 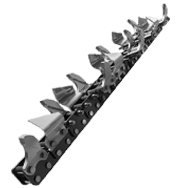 Twin Spoil Augers remove finely crumbled spoil to both sides of the trench while a Spring Loaded Crumber ensures maximum spoil removal and a clean trench. Our crumber gives you a real Headstart over your competitors. 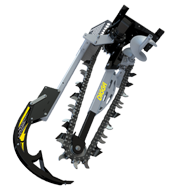 Now fitted to each trencher model, there is no need to fold back when starting your trench. Its super heavy duty spring ensures the crumber stays engaged with the bottom of the trench for maximum spoil removal. The unique geometry of the crumber ensures it travels with maximum engagement with the bottom of the trench from start to finish. 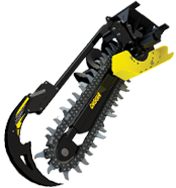 The Anti-back Flex Design prevents the chain links from flexing back in tough soil conditions. Available in a number of different tooth configurations for trenching in soft ground, mixed grounds and even permafrost to allow you to get the job done no matter what environment you are in. All trenchers are covered by Digga's industry leading warranty. To find out more about our lifetime warranty and to register your product online, please follow the respective links.